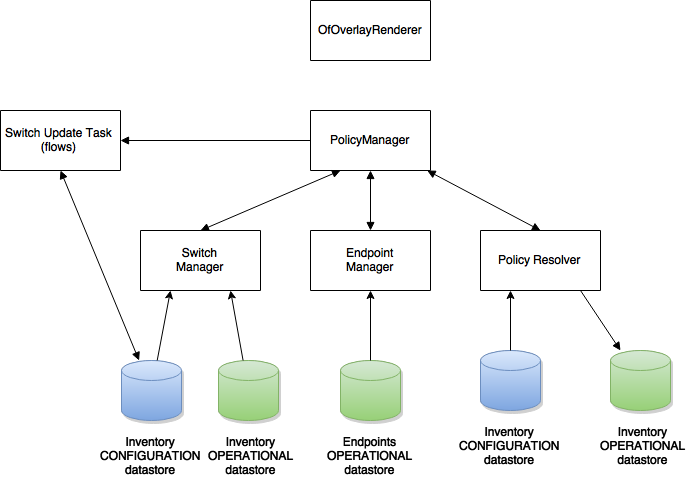 OpenDaylight Group Based Policy allows users to express network configuration in a declarative versus imperative way. This is often described as asking for “what you want”, rather than “how to do it”. In order to achieve this Group Based Policy (herein referred to as GBP) is an implementation of an Intent System. 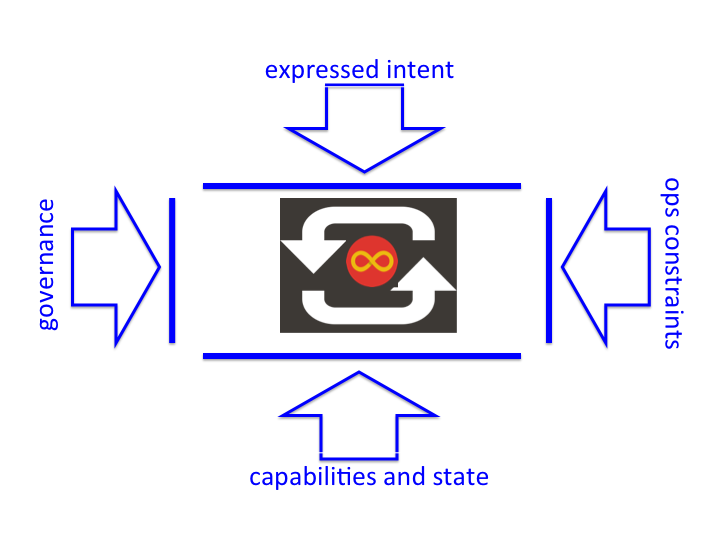 expressed intent is the entry point into the system. operational constraints provide policy for the usage of the system which modulates how the system is consumed. For instance “All Financial applications must use a specific encryption standard”. capabilities and state are provided by renderers. Renderers dynamically provide their capabilities to the core model, allowing the core model to remain non-domain specific. In summary GBP is about the Automation of Intent. By focusing on Model. Process. Automation, a consistent policy resolution process enables for mapping between the expressed intent and renderers responsible for providing the capabilities of implementing that intent. To an optical network: The port maybe abstract, yet the optical wavelength is concrete. It is important to show the overall philosophy of GBP as it sets the project’s direction. In this release of OpenDaylight, GBP focused on expressed intent, refactoring of how renderers consume and publish Subject Feature Definitions for multi-renderer support. In order to explain the fundamental value proposition of GBP, an illustrated example is given. In order to do that some terminology must be defined. The Access Model is the core of the GBP Intent System policy resolution process. EndpointGroups are sets of endpoints that share a common set of policies. EndpointGroups can participate in contracts that determine the kinds of communication that are allowed. EndpointGroups consume and provide contracts. They also expose both requirements and capabilities, which are labels that help to determine how contracts will be applied. An EndpointGroup can specify a parent EndpointGroup from which it inherits. Contracts determine which endpoints can communicate and in what way. Contracts between pairs of EndpointGroups are selected by the contract selectors defined by the EndpointGroup. Contracts expose qualities, which are labels that can help EndpointGroups to select contracts. Once the contract is selected, contracts have clauses that can match against requirements and capabilities exposed by EndpointGroups, as well as any conditions that may be set on endpoints, in order to activate subjects that can allow specific kinds of communication. A contract is allowed to specify a parent contract from which it inherits. Subjects describe some aspect of how two endpoints are allowed to communicate. Subjects define an ordered list of rules that will match against the traffic and perform any necessary actions on that traffic. No communication is allowed unless a subject allows that communication. Clauses are defined as part of a contract. Clauses determine how a contract should be applied to particular endpoints and EndpointGroups. Clauses can match against requirements and capabilities exposed by EndpointGroups, as well as any conditions that may be set on endpoints. Matching clauses define some set of subjects which can be applied to the communication between the pairs of endpoints. GBP offers an intent based interface, accessed via the UX, via the REST API or directly from a domain-specific-language such as Neutron through a mapping interface. The classifier and action portions of the model can be thought of as hooks, with their definition provided by each renderer about its domain specific capabilities. 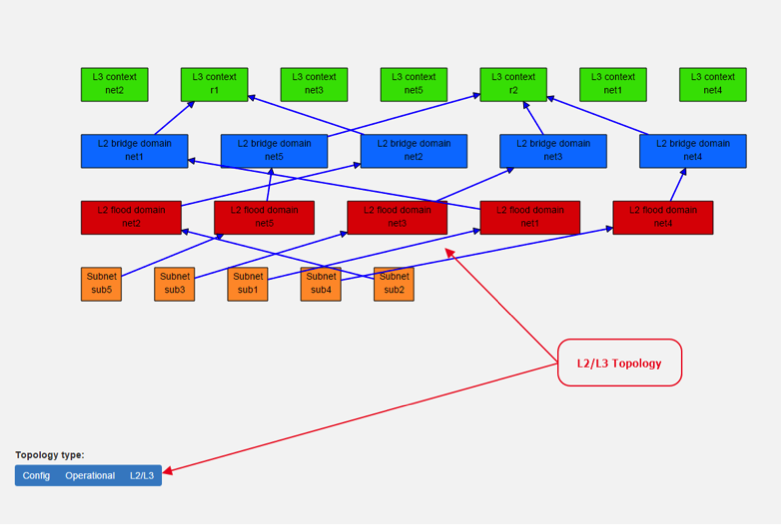 In GBP for this release, there is one renderer, the OpenFlow Overlay renderer (OfOverlay). These hooks are filled with definitions of the types of features the renderer can provide the subject, and are called subject-feature-definitions. This means an expressed intent can be fulfilled by, and across, multiple renderers simultaneously, without any specific provisioning from the consumer of GBP. Since GBP is implemented in OpenDaylight, which is an SDN controller, it also must address networking. This is done via the forwarding model, which is domain specific to networking, but could be applied to many different types of networking. normal IP stack behaviour, where ARP is performed in subnet, and for out of subnet, traffic is sent to default gateway. 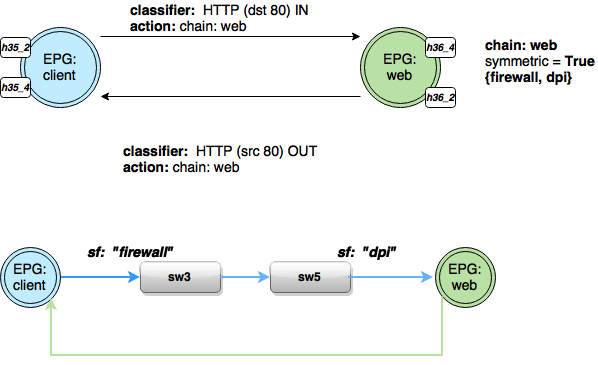 In this example, the EPG:webservers is providing the web and ssh contracts. The EPG:client is consuming those contracts. 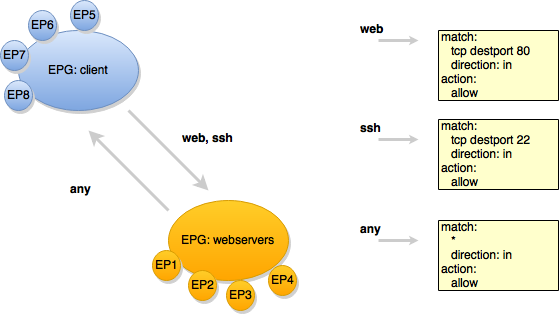 EPG:client is providing the any contract, which is consumed by EPG:webservers. When the forwarding model is considered in the figure above, it can be seen that even though all endpoints are communicating using a common set of contracts, their forwarding is contained by the forwarding model contexts or namespaces. 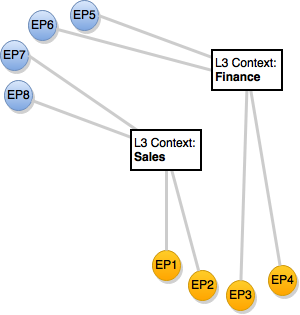 In the example shown, the endpoints associated with a network-containment that has an ultimate parent of L3Context:Sales can only communicate with other endpoints within this L3Context. In this way L3VPN services can be implemented without any impact to the Intent of the contract. The major benefit of this architecture is that the mapping of the domain-specific-language is completely separate and independent of the underlying renderer implementation. 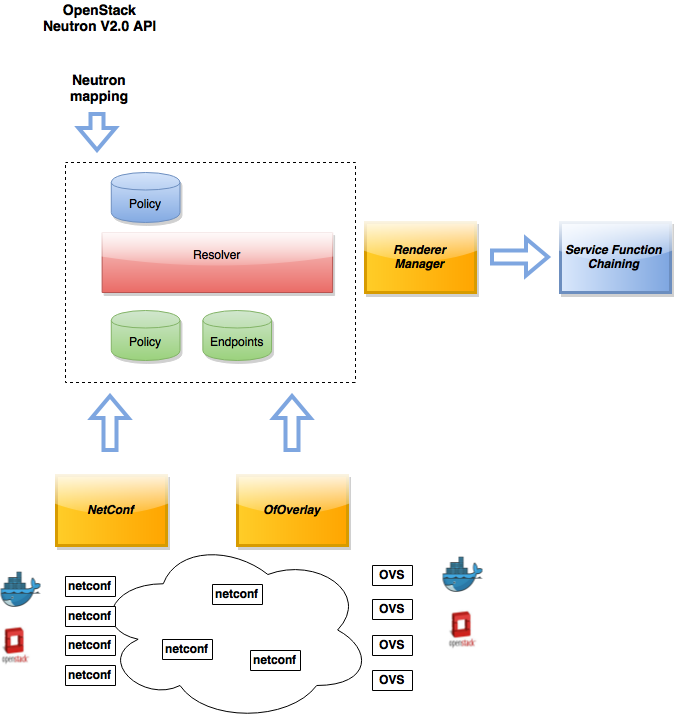 For instance, using the Neutron Mapper, which maps the Neutron API to the GBP core model, any contract automatically generated from this mapping can be augmented via the UX to use Service Function Chaining, a capability not currently available in OpenStack Neutron. separates concerns: the Expressed Intent is kept completely separated from the underlying renderers. The first step in policy resolution is to select the contracts that are in scope. Named selectors simply select a specific contract by its contract ID. Target selectors allow for additional flexibility by matching against qualities of the contract’s target. Select a contract by contract ID, and participate as a provider. Match against a contract’s target with a quality matcher, and participate as a provider. Select a contract by contract ID, and participate as a consumer. Match against a contract’s target with a quality matcher, and participate as a consumer. To determine which contracts are in scope, contracts are found where either the source EndpointGroup selects a contract as either a provider or consumer, while the destination EndpointGroup matches against the same contract in the corresponding role. So if endpoint x in EndpointGroup X is communicating with endpoint y in EndpointGroup Y, a contract C is in scope if either X selects C as a provider and Y selects C as a consumer, or vice versa. The details of how quality matchers work are described further in Matchers. Quality matchers provide a flexible mechanism for contract selection based on labels. The name of the selector in the provider EndpointGroup that was used to select the contract, called the matching provider selector. The name of the selector in the consumer EndpointGroup that was used to select the contract, called the matching consumer selector. The result is then stored in the datastore under Resolved Policy. The second phase in policy resolution is to determine which subjects are in scope. The subjects define what kinds of communication are allowed between endpoints in the EndpointGroups. For each of the selected contract scopes from the contract selection phase, the subject selection procedure is applied. 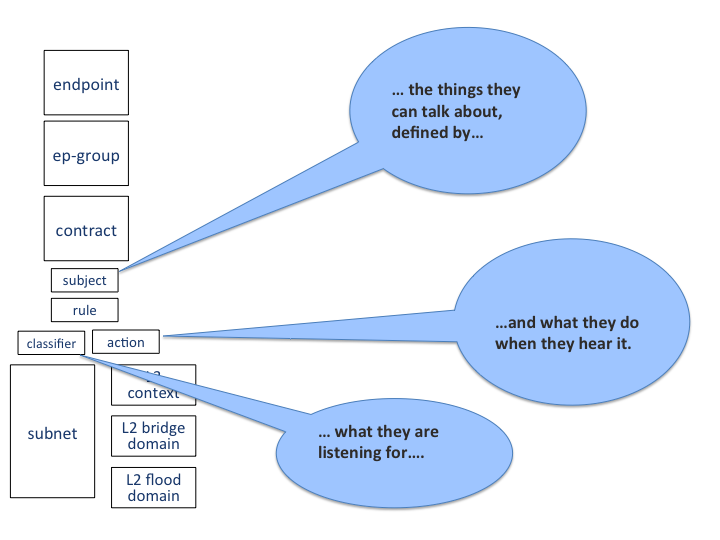 Labels called, capabilities, requirements and conditions are matched against to bring a Subject into scope. EndpointGroups have capabilities and requirements, while endpoints have conditions. When acting as a provider, EndpointGroups expose capabilities, which are labels representing specific pieces of functionality that can be exposed to other EndpointGroups that may meet functional requirements of those EndpointGroups. 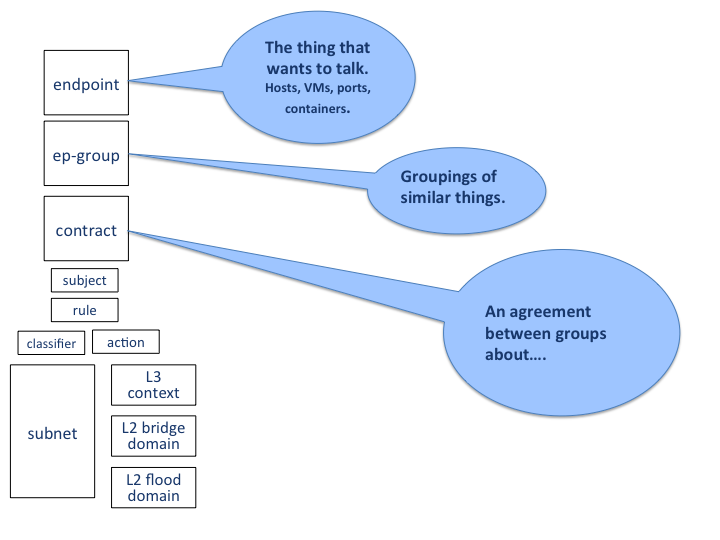 When acting as a consumer, EndpointGroups expose requirements, which are labels that represent that the EndpointGroup requires some specific piece of functionality. As an example, we might create a capability called “user-database” which indicates that an EndpointGroup contains endpoints that implement a database of users. We might create a requirement also called “user-database” to indicate an EndpointGroup contains endpoints that will need to communicate with the endpoints that expose this service. Note that in this example the requirement and capability have the same name, but the user need not follow this convention. The matching provider selector (that was used by the provider EndpointGroup to select the contract) is examined to determine the capabilities exposed by the provider EndpointGroup for this contract scope. The provider selector will have a list of capabilities either directly included in the provider selector or inherited from a parent selector or parent EndpointGroup. (See Inheritance). Similarly, the matching consumer selector will expose a set of requirements. Endpoints can have conditions, which are labels representing some relevant piece of operational state related to the endpoint. An example of a condition might be “malware-detected,” or “authentication-succeeded.” Conditions are used to affect how that particular endpoint can communicate. To continue with our example, the “malware-detected” condition might cause an endpoint’s connectivity to be cut off, while “authentication-succeeded” might open up communication with services that require an endpoint to be first authenticated and then forward its authentication credentials. Clauses perform the actual selection of subjects. A clause has lists of matchers in two categories. In order for a clause to become active, all lists of matchers must match. A matching clause will select all the subjects referenced by the clause. Note that an empty list of matchers counts as a match. Matches against requirements in the matching consumer selector. Label based criteria for matching against endpoints. In this release this can be used to label endpoints based on IpPrefix. Matches against capabilities in the matching provider selector. Clauses have a list of subjects that apply when all the matchers in the clause match. The output of the subject selection phase logically is a set of subjects that are in scope for any particular pair of endpoints. Now subjects have been selected that apply to the traffic between a particular set of endpoints, policy can be applied to allow endpoints to communicate. The applicable subjects from the previous step will each contain a set of rules. Rules consist of a set of classifiers and a set of actions. Classifiers match against traffic between two endpoints. An example of a classifier would be something that matches against all TCP traffic on port 80, or one that matches against HTTP traffic containing a particular cookie. Actions are specific actions that need to be taken on the traffic before it reaches its destination. Actions could include tagging or encapsulating the traffic in some way, redirecting the traffic, or applying a service function chain. Rules, subjects, and actions have an order parameter, where a lower order value means that a particular item will be applied first. All rules from a particular subject will be applied before the rules of any other subject, and all actions from a particular rule will be applied before the actions from another rule. If more than item has the same order parameter, ties are broken with a lexicographic ordering of their names, with earlier names having logically lower order. used in target selectors during the contract selection phase. Quality matchers provide a more advanced and flexible way to select contracts compared to a named selector. which means the matcher matches when none of its labels match. Additionally each label to match can optionally include a relevant name field. For quality matchers, this is a target name. For capability and requirement matchers, this is a selector name. If the name field is specified, then the matcher will only match against targets or selectors with that name, rather than any targets or selectors. EndpointGroups will inherit all their selectors from their parent EndpointGroups. Selectors with the same names as selectors in the parent EndpointGroups will inherit their behavior as defined below. Selectors include provider named selectors, provider target selectors, consumer named selectors, and consumer target selectors. Selectors cannot themselves have parent selectors, but when selectors have the same name as a selector of the same type in the parent EndpointGroup, then they will inherit from and override the behavior of the selector in the parent EndpointGroup. Named selectors will add to the set of contract IDs that are selected by the parent named selector. A target selector in the child EndpointGroup with the same name as a target selector in the parent EndpointGroup will inherit quality matchers from the parent. If a quality matcher in the child has the same name as a quality matcher in the parent, then it will inherit as described below under Matchers. Contracts will inherit all their targets, clauses and subjects from their parent contracts. When any of these objects have the same name as in the parent contract, then the behavior will be as defined below. Targets cannot themselves have a parent target, but it may inherit from targets with the same name as the target in a parent contract. Qualities in the target will be inherited from the parent. If a quality with the same name is defined in the child, then this does not have any semantic effect except if the quality has its inclusion-rule parameter set to “exclude.” In this case, then the label should be ignored for the purpose of matching against this target. Subjects cannot themselves have a parent subject, but it may inherit from a subject with the same name as the subject in a parent contract. The order parameter in the child subject, if present, will override the order parameter in the parent subject. The rules in the parent subject will be added to the rules in the child subject. However, the rules will not override rules of the same name. Instead, all rules in the parent subject will be considered to run with a higher order than all rules in the child; that is all rules in the child will run before any rules in the parent. This has the effect of overriding any rules in the parent without the potentially-problematic semantics of merging the ordering. Clauses cannot themselves have a parent clause, but it may inherit from a clause with the same name as the clause in a parent contract. The list of subject references in the parent clause will be added to the list of subject references in the child clause. This is just a union operation. A subject reference that refers to a subject name in the parent contract might have that name overridden in the child contract. Each of the matchers in the clause are also inherited by the child clause. Matchers in the child of the same name and type as a matcher from the parent will inherit from and override the parent matcher. See below under Matchers for more information. Matchers include quality matchers, condition matchers, requirement matchers, and capability matchers. Matchers cannot themselves have parent matchers, but when there is a matcher of the same name and type in the parent object, then the matcher in the child object will inherit and override the behavior of the matcher in the parent object. The match type, if specified in the child, overrides the value specified in the parent. Labels are also inherited from the parent object. If there is a label with the same name in the child object, this does not have any semantic effect except if the label has its inclusion-rule parameter set to “exclude.” In this case, then the label should be ignored for the purpose of matching. Otherwise, the label with the same name will completely override the label from the parent. Governance view consists from three columns. In the left column is Health section with Exception and Conflict buttons with no functionality yet. This is a placeholder for development in further releases. In the top half of this section is select box with list of tenants for select. Once the tenant is selected, all sub sections in application operate and display data with actual selected tenant. Below the select box are buttons which display Expressed or Delivered policy of Governance section. In the bottom half of this section is select box with list of renderers for select. There is currently only OfOverlay renderer available. 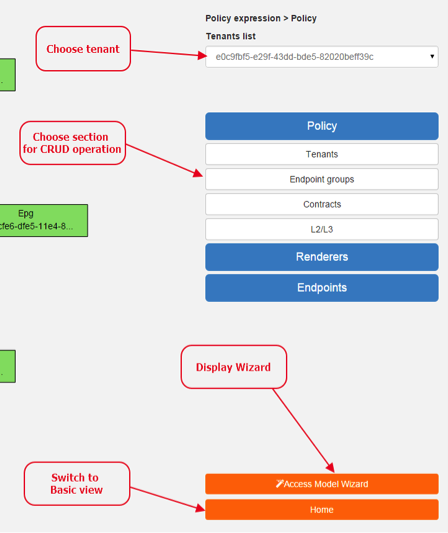 Below the select box is Renderer configuration button, which switch the app into the Policy expression view with Renderers section expanded for performing CRUD operations. Renderer state button display Renderer state view. In the bottom part of the right section of Governance view is Home button which switch the app to the Basic view. In the top part is situated navigation menu with four main sections. 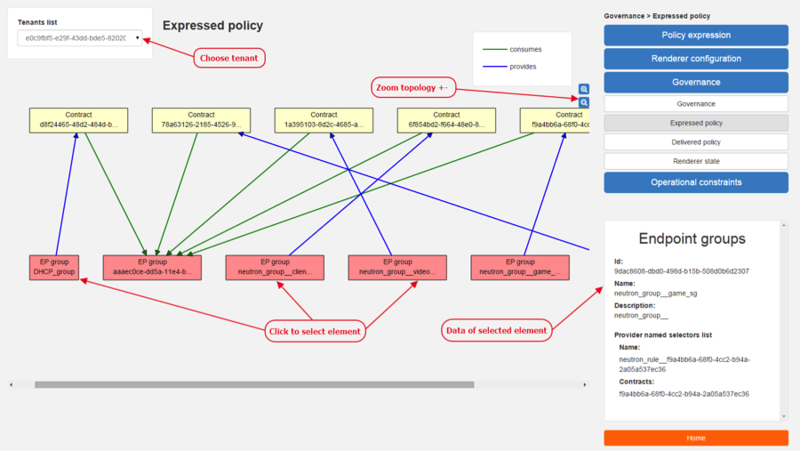 Policy expression button expand/collapse sub menu with three main parts of Policy expression. By clicking on sub menu buttons, user will be switched into the Policy expressions view with appropriate section expanded for performing CRUD operations. Renderer configuration button switches user into the Policy expressions view. Governance button expand/collapse sub menu with four main parts of Governance section. Sub menu buttons of Governance section display appropriate section of Governance view. Operational constraints have no functionality yet, and is a placeholder for development in further releases. Below the menu is place for view info section which displays info about actual selected element from the topology (explained below). 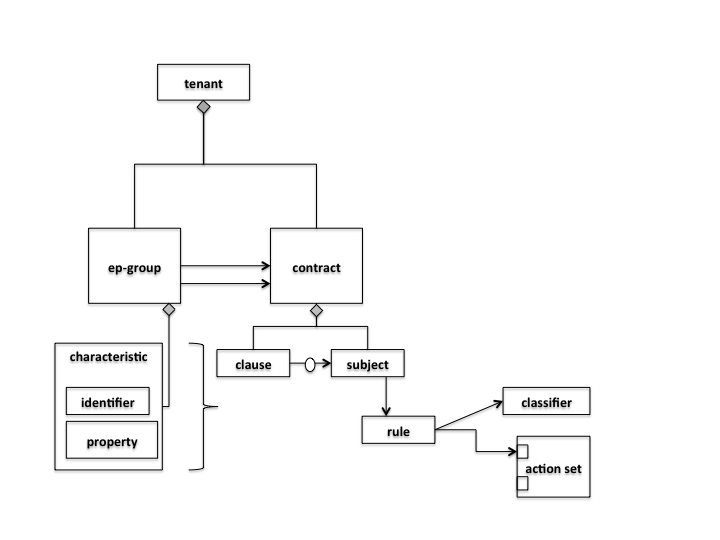 In this view are displayed contracts with their consumed and provided EndpointGroups of actual selected tenant, which can be changed in select box in the upper left corner. By single-clicking on any contract or EPG, the data of actual selected element will be shown in the right column below the menu. A Manage button launches a display wizard window for managing configuration of items such as Service Function Chaining. 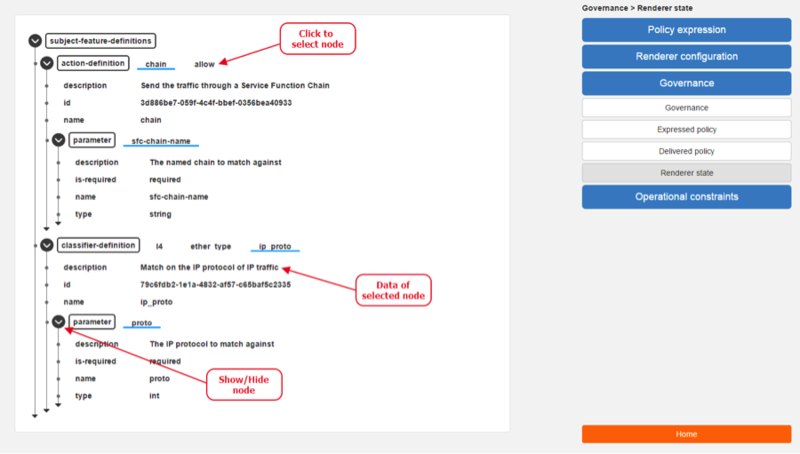 Governance view – Delivered policy In this view are displayed subjects with their consumed and provided EndpointGroups of actual selected tenant, which can be changed in select box in the upper left corner. By single-clicking on any subject or EPG, the data of actual selected element will be shown in the right column below the menu. 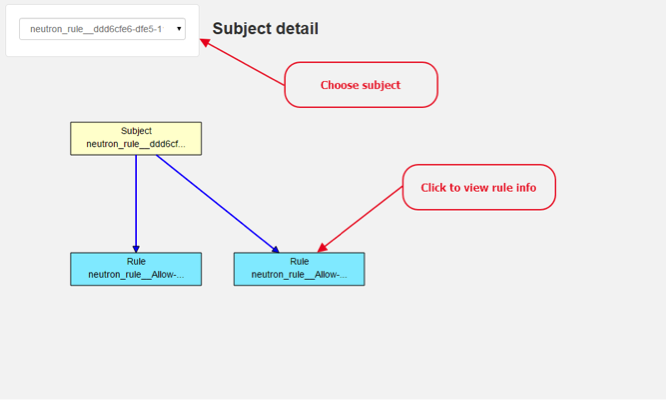 By double-click on subject the subject detail view will be displayed with subject’s rules of actual selected subject, which can be changed in select box in the upper left corner. By single-clicking on rule or subject, the data of actual selected element will be shown in the right column below the menu. By double-clicking on EPG in Delivered policy view, the EPG detail view will be displayed with EPG’s endpoints of actual selected EPG, which can be changed in select box in the upper left corner. By single-clicking on EPG or endpoint the data of actual selected element will be shown in the right column below the menu. In this part are displayed Subject feature definition data with two main parts: Action definition and Classifier definition. By clicking on the down/right arrow in the circle is possible to expand/hide data of appropriate container or list. Next to the list node are displayed names of list’s elements where one is always selected and element’s data are shown (blue line under the name). By clicking on names of children nodes is possible to select desired node and node’s data will be displayed. In the left part of this view is placed topology of actual selected elements with the buttons for switching between types of topology at the bottom. Right column of this view contains four parts. At the top of this column are displayed breadcrumbs with actual position in the application. Below the breadcrumbs is select box with list of tenants for select. In the middle part is situated navigation menu, which allows switch to the desired section for performing CRUD operations. At the bottom is quick navigation menu with Access Model Wizard button which display Wizard view, Home button which switch application to the Basic view and occasionally Back button, which switch application to the upper section. To open Policy expression, select Policy expression from the GBP Home screen. In the top of navigation box you can select the tenant from the tenants list to activate features addicted to selected tenant. In the right menu, by default, the Policy menu section is expanded. Subitems of this section are modules for CRUD (creating, reading, updating and deleting) of tenants, EndpointGroups, contracts, L2/L3 objects. Section Renderers contains CRUD forms for Classifiers and Actions. Section Endpoints contains CRUD forms for Endpoint and L3 prefix endpoint. Operational topology - displays same information but is based on operational data. 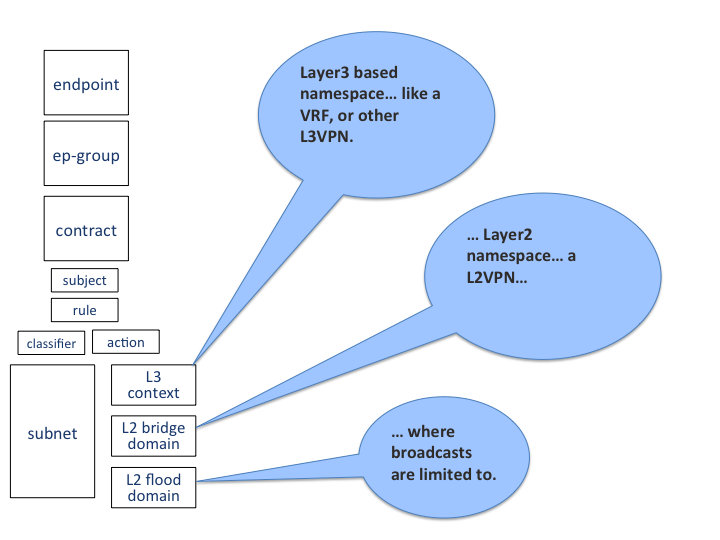 L2/L3 - displays relationships between L3Contexts, L2 Bridge domains, L2 Flood domains and Subnets. In this part are described basic flows for viewing, adding, editing and deleting system elements like tenants, EndpointGroups etc. To edit tenant objects click the Tenants button in the right menu. You can see the CRUD form containing tenants list and control buttons. To add new tenant, click the Add button This will display the form for adding a new tenant. After filling tenant attributes Name and Description click Save button. Saving of any object can be performed only if all the object attributes are filled correctly. If some attribute doesn’t have correct value, exclamation mark with mouse-over tooltip will be displayed next to the label for the attribute. After saving of tenant the form will be closed and the tenants list will be set to default value. To view an existing tenant, select the tenant from the select box Tenants list. The view form is read-only and can be closed by clicking cross mark in the top right of the form. To edit selected tenant, click the Edit button, which will display the edit form for selected tenant. After editing the Name and Description of selected tenant click the Save button to save selected tenant. After saving of tenant the edit form will be closed and the tenants list will be set to default value. To delete tenant select the tenant from the Tenants list and click Delete button. To return to the Policy expression click Back button on the bottom of window. For managing EndpointGroups (EPG) the tenant from the top Tenants list must be selected. To add new EPG click Add button and after filling required attributes click Save button. After adding the EPG you can edit it and assign Consumer named selector or Provider named selector to it. To edit EPG click the Edit button after selecting the EPG from Group list. To add new Consumer named selector (CNS) click the Add button next to the Consumer named selectors list. While CNS editing you can set one or more contracts for current CNS pressing the Plus button and selecting the contract from the Contracts list. To remove the contract, click on the cross mark next to the contract. Added CNS can be viewed, edited or deleted by selecting from the Consumer named selectors list and clicking the Edit and Delete buttons like with the EPG or tenants. To add new Provider named selector (PNS) click the Add button next to the Provider named selectors list. While PNS editing you can set one or more contracts for current PNS pressing the Plus button and selecting the contract from the Contracts list. To remove the contract, click on the cross mark next to the contract. Added PNS can be viewed, edited or deleted by selecting from the Provider named selectors list and clicking the Edit and Delete buttons like with the EPG or tenants. To delete EPG, CNS or PNS select it in selectbox and click the Delete button next to the selectbox. For managing contracts the tenant from the top Tenants list must be selected. To add new Contract click Add button and after filling required fields click Save button. 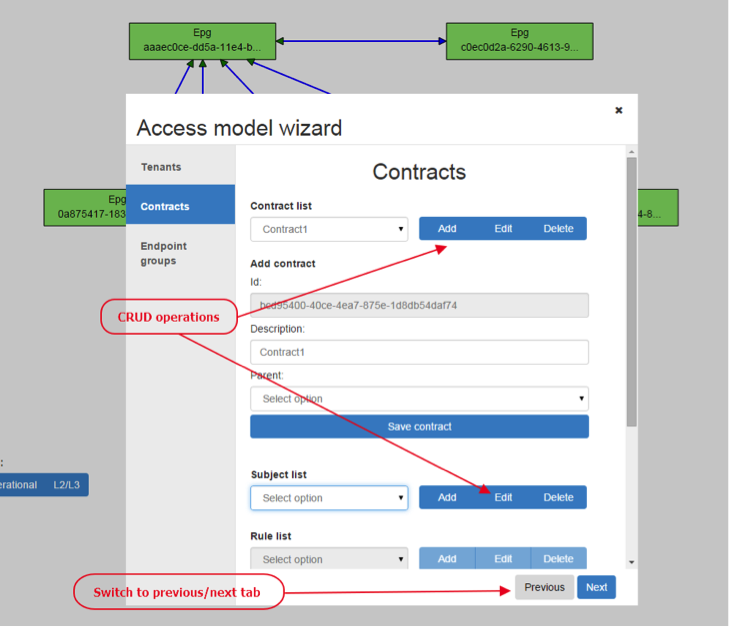 After adding the Contract user can edit it by selecting in the Contracts list and clicking Edit button. To add new Clause click Add button next to the Clause list while editing the contract. While editing the Clause after selecting clause from the Clause list user can assign clause subjects by clicking the Plus button next to the Clause subjects label. Adding and editing action must be submitted by pressing Save button. To manage Subjects you can use CRUD form like with the Clause list. For managing L2/L3 the tenant from the top Tenants list must be selected. To add L3 Context click the Add button next to the L3 Context list ,which will display the form for adding a new L3 Context. After filling L3 Context attributes click Save button. After saving of L3 Context, form will be closed and the L3 Context list will be set to default value. To view an existing L3 Context, select the L3 Context from the select box L3 Context list. The view form is read-only and can be closed by clicking cross mark in the top right of the form. If user wants to edit selected L3 Context, click the Edit button, which will display the edit form for selected L3 Context. After editing click the Save button to save selected L3 Context. After saving of L3 Context, the edit form will be closed and the L3 Context list will be set to default value. To delete L3 Context, select it from the L3 Context list and click Delete button. To add L2 Bridge Domain, click the Add button next to the L2 Bridge Domain list. This will display the form for adding a new L2 Bridge Domain. After filling L2 Bridge Domain attributes click Save button. After saving of L2 Bridge Domain, form will be closed and the L2 Bridge Domain list will be set to default value. To view an existing L2 Bridge Domain, select the L2 Bridge Domain from the select box L2 Bridge Domain list. The view form is read-only and can be closed by clicking cross mark in the top right of the form. If user wants to edit selected L2 Bridge Domain, click the Edit button, which will display the edit form for selected L2 Bridge Domain. After editing click the Save button to save selected L2 Bridge Domain. After saving of L2 Bridge Domain the edit form will be closed and the L2 Bridge Domain list will be set to default value. To delete L2 Bridge Domain select it from the L2 Bridge Domain list and click Delete button. To add L3 Flood Domain, click the Add button next to the L3 Flood Domain list. 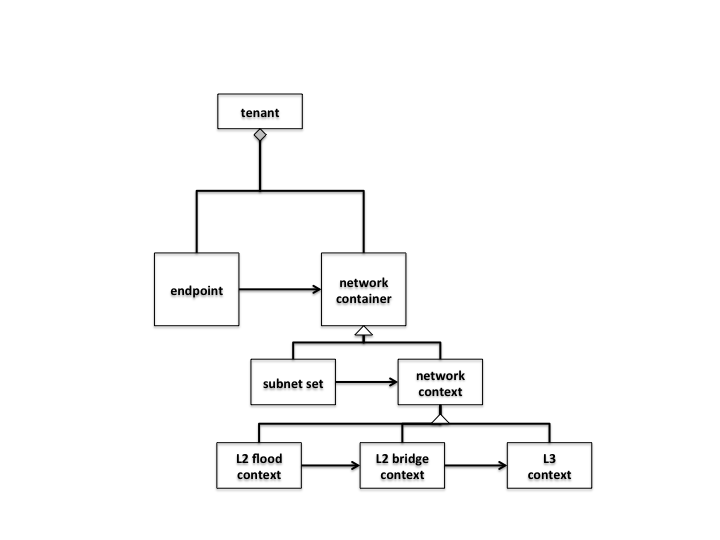 This will display the form for adding a new L3 Flood Domain. After filling L3 Flood Domain attributes click Save button. After saving of L3 Flood Domain, form will be closed and the L3 Flood Domain list will be set to default value. To view an existing L3 Flood Domain, select the L3 Flood Domain from the select box L3 Flood Domain list. The view form is read-only and can be closed by clicking cross mark in the top right of the form. If user wants to edit selected L3 Flood Domain, click the Edit button, which will display the edit form for selected L3 Flood Domain. After editing click the Save button to save selected L3 Flood Domain. After saving of L3 Flood Domain the edit form will be closed and the L3 Flood Domain list will be set to default value. To delete L3 Flood Domain select it from the L3 Flood Domain list and click Delete button. To add Subnet click the Add button next to the Subnet list. This will display the form for adding a new Subnet. After filling Subnet attributes click Save button. After saving of Subnet, form will be closed and the Subnet list will be set to default value. 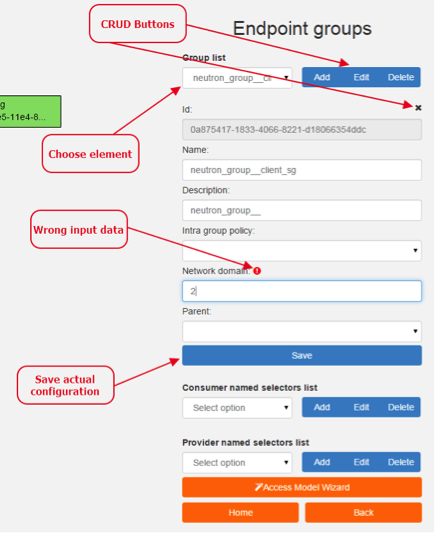 To view an existing Subnet, select the Subnet from the select box Subnet list. The view form is read-only and can be closed by clicking cross mark in the top right of the form. If user wants to edit selected Subnet, click the Edit button, which will display the edit form for selected Subnet. After editing click the Save button to save selected Subnet. After saving of Subnet the edit form will be closed and the Subnet list will be set to default value. To delete Subnet select it from the Subnet list and click Delete button. To add Classifier, click the Add button next to the Classifier list. This will display the form for adding a new Classifier. After filling Classifier attributes click Save button. After saving of Classifier, form will be closed and the Classifier list will be set to default value. To view an existing Classifier, select the Classifier from the select box Classifier list. The view form is read-only and can be closed by clicking cross mark in the top right of the form. If you want to edit selected Classifier, click the Edit button, which will display the edit form for selected Classifier. After editing click the Save button to save selected Classifier. After saving of Classifier the edit form will be closed and the Classifier list will be set to default value. To delete Classifier select it from the Classifier list and click Delete button. To add Action, click the Add button next to the Action list. This will display the form for adding a new Action. After filling Action attributes click Save button. After saving of Action, form will be closed and the Action list will be set to default value. To view an existing Action, select the Action from the select box Action list. The view form is read-only and can be closed by clicking cross mark in the top right of the form. If user wants to edit selected Action, click the Edit button, which will display the edit form for selected Action. After editing click the Save button to save selected Action. After saving of Action the edit form will be closed and the Action list will be set to default value. To delete Action select it from the Action list and click Delete button. To add Endpoint, click the Add button next to the Endpoint list. This will display the form for adding a new Endpoint. 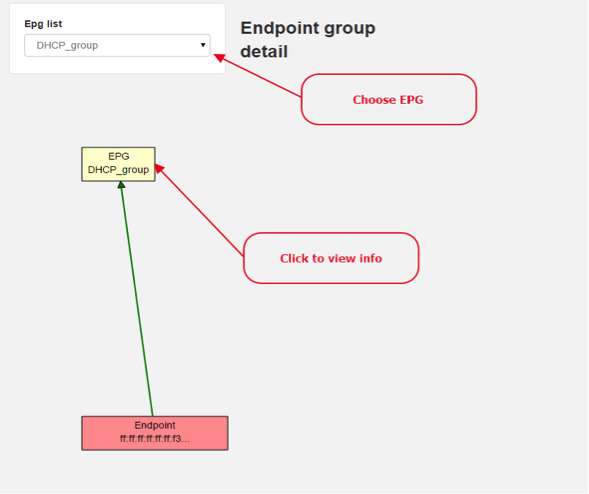 To add EndpointGroup assignment click the Plus button next to the label EndpointGroups. To add Condition click Plus button next to the label Condition. To add L3 Address click the Plus button next to the L3 Addresses label. After filling Endpoint attributes click Save button. After saving of Endpoint, form will be closed and the Endpoint list will be set to default value. To view an existing Endpoint just, the Endpoint from the select box Endpoint list. The view form is read-only and can be closed by clicking cross mark in the top right of the form. If you want to edit selected Endpoint, click the Edit button, which will display the edit form for selected Endpoint. After editing click the Save button to save selected Endpoint. After saving of Endpoint the edit form will be closed and the Endpoint list will be set to default value. To delete Endpoint select it from the Endpoint list and click Delete button. To add L3 prefix endpoint, click the Add button next to the L3 prefix endpoint list. This will display the form for adding a new Endpoint. To add EndpointGroup assignment, click the Plus button next to the label EndpointGroups. To add Condition, click Plus button next to the label Condition. To add L2 gateway click the Plus button next to the L2 gateways label. To add L3 gateway, click the Plus button next to the L3 gateways label. After filling L3 prefix endpoint attributes click Save button. After saving of L3 prefix endpoint, form will be closed and the Endpoint list will be set to default value. To view an existing L3 prefix endpoint, select the Endpoint from the select box L3 prefix endpoint list. The view form is read-only and can be closed by clicking cross mark in the top right of the form. If you want to edit selected L3 prefix endpoint, click the Edit button, which will display the edit form for selected L3 prefix endpoint. After editing click the Save button to save selected L3 prefix endpoint. After saving of Endpoint the edit form will be closed and the Endpoint list will be set to default value. To delete Endpoint select it from the L3 prefix endpoint list and click Delete button. Wizard provides quick method to send basic data to controller necessary for basic usage of GBP application. It is useful in the case that there aren’t any data in controller. In the first tab is form for create tenant. The second tab is for CRUD operations with contracts and their sub elements such as subjects, rules, clauses, action refs and classifier refs. The last tab is for CRUD operations with EndpointGroups and their CNS and PNS. Created structure of data is possible to send by clicking on Submit button. When associated with a Neutron Port, this leverages the OfOverlay renderer’s NAT capabilities. The GBP Renderer manager is an integral part of GBP base module. 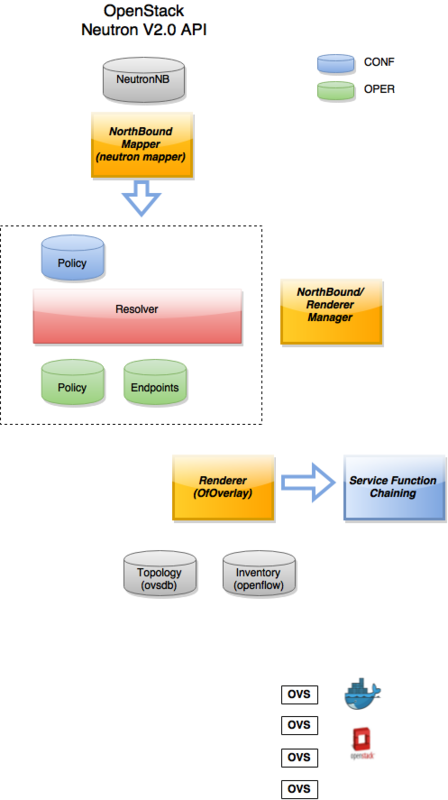 It dispatches information about endpoints’ policy configuration to specific device renderer by writing a renderer policy configuration into the registered renderer’s policy store. Renderer manager is integrated into GBP base module, so no additional installation is required. 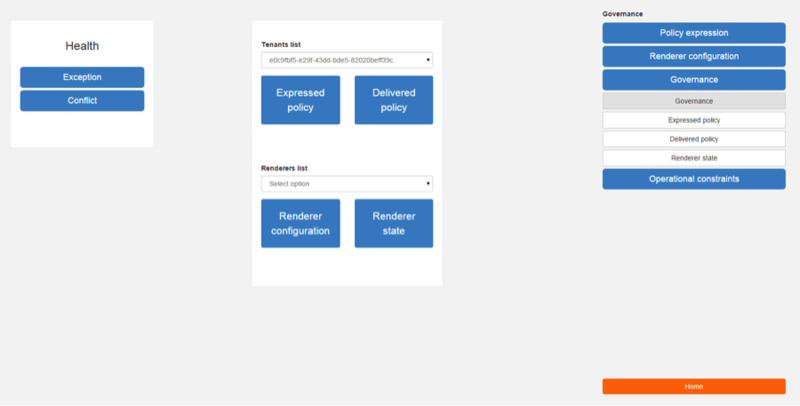 Based on data from notifications it creates a configuration task for specific renderers by writing a renderer policy configuration into the registered renderer’s policy store. Configuration is stored to CONF data store as Renderers (renderer.yang). Configuration is signed with version number which is incremented by every change. All renderers are supposed to be on the same version. Renderer manager waits for all renderers to respond with version update in OPER data store. After a version of every renderer in OPER data store has the same value as the one in CONF data store, renderer manager moves to the next configuration with incremented version. Location manager monitors information about Endpoint Location providers (see endpoint-location-provider.yang) and manages Endpoint locations in OPER data store accordingly. Location manager is integrated into GBP base module, so no additional installation is required. The endpoint-locations container in OPER data store (see base-endpoint.yang) contains two lists for two types of EP location, namely address-endpoint-location and containment-endpoint-location. LocationResolver is a class that processes Location providers in CONF data store and puts location information to OPER data store. When a new Location provider is created in CONF data store, its Address EP locations are being processed first, and their info is stored locally in accordance with processed Location provider’s priority. Then a location of type “absolute” with the highest priority is selected for an EP, and is put in OPER data store. If Address EP locations contain locations of type “relative”, those are put to OPER data store. If current Location provider contains Containment EP locations of type “relative”, then those are put to OPER data store. Similarly, when a Location provider is deleted, information of its locations is removed from the OPER data store. The OpenFlow Overlay (OfOverlay) feature enables the OpenFlow Overlay renderer, which creates a network virtualization solution across nodes that host Open vSwitch software switches. This renderer is designed to work with OpenVSwitch (OVS) 2.1+ (although 2.3 is strongly recommended) and OpenFlow 1.3. When used in conjunction with the Neutron Mapper feature no extra OfOverlay specific setup is required. and creating the VXLAN/VXLAN-GPE tunnel ports on the bridges. The GBP OfOverlay renderer also supports a table offset option, to offset the pipeline post-table 0. The value of table offset is stored in the config datastore and it may be rewritten at runtime. To avoid overwriting runtime changes, the default value is used only when the OfOverlay renderer starts and no other value has been written before. These are the primary components of GBP. The OfOverlay components are highlighted in red. Policy resolution is completely domain independent, and the OfOverlay leverages process policy information internally. See Policy Resolution process. It listens to inputs to the Tenants configuration datastore, validates tenant input, then writes this to the Tenants operational datastore. From there an internal notification is generated to the PolicyManager. In the next release, this will be moving to a non-renderer specific location. 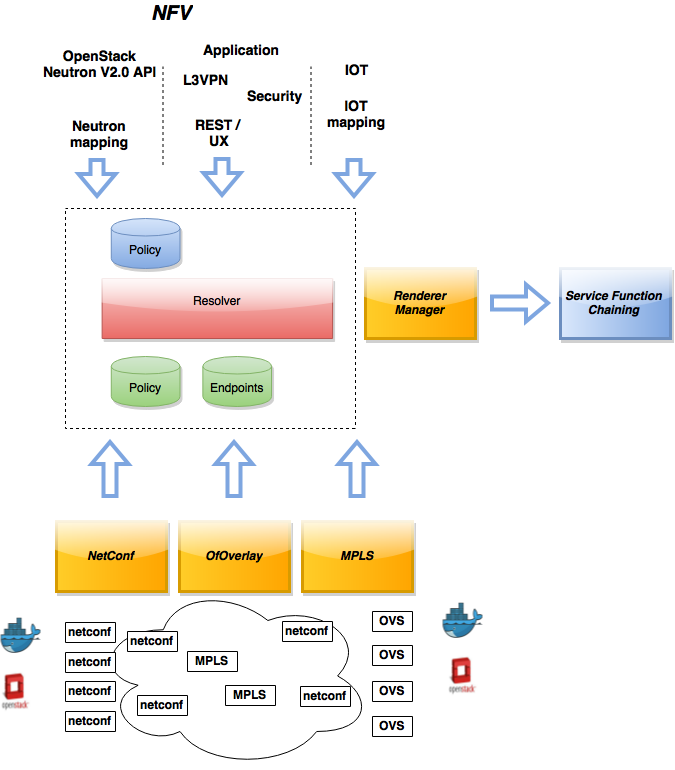 When using the Neutron mapper feature, everything is managed transparently via Neutron. The Endpoint Manager is responsible for listening to Endpoint repository updates and notifying the Switch Manager when a valid Endpoint has been registered. It also supplies utility functions to the flow pipeline process. The Switch Manager is purely a state manager. having at least one endpoint connected. In this way GBP is not writing to switches it has no business to. Disconnected means a previously connected switch is no longer present in the Inventory operational datastore. Translate from Outside to Inside and perform same functions as SourceMapper. Establishes tunnels at valid destination switches for ingress. Manages routing based on valid ingress nodes ARP’ing for their default gateway, and matches on either gateway MAC or destination endpoint MAC. Once the Source and Destination EndpointGroups are assigned, policy is enforced based on resolved rules. 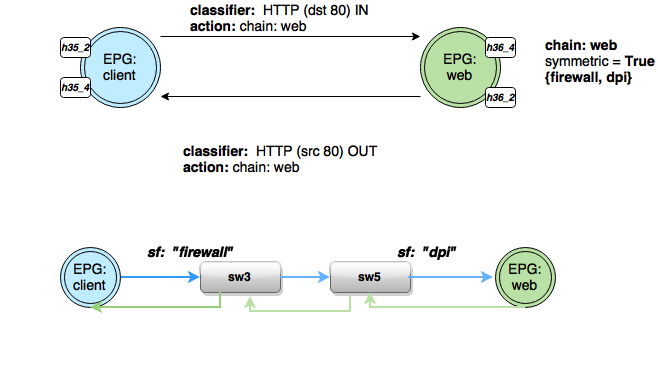 In the case of Service Function Chaining, the encapsulation and destination for traffic destined to a chain, is discovered and enforced. 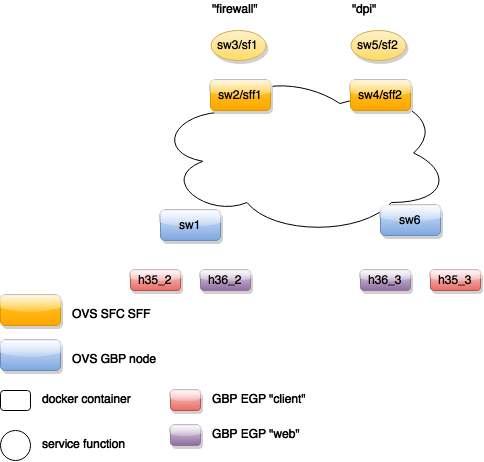 Performs NAT function before Egressing OVS instance to the underlay network. 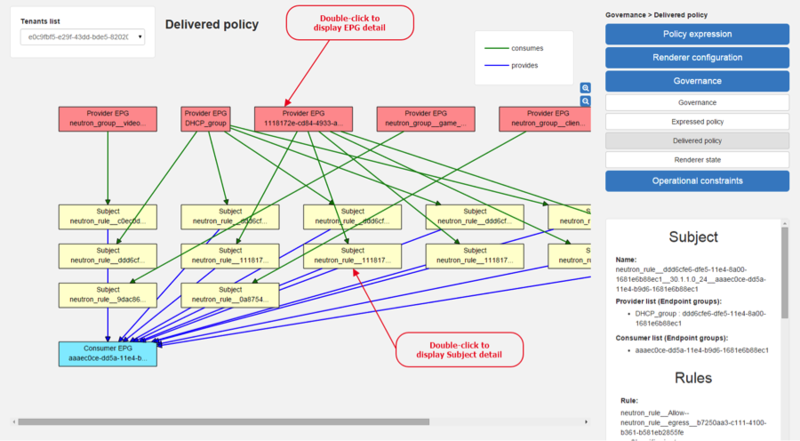 Manages post-policy enforcement for endpoint specific destination effects. Specifically for Service Function Chaining, which is why we can support both symmetric and asymmetric chains and distributed ingress/egress classification. Please see the UX section on how to configure GBP via the GUI. 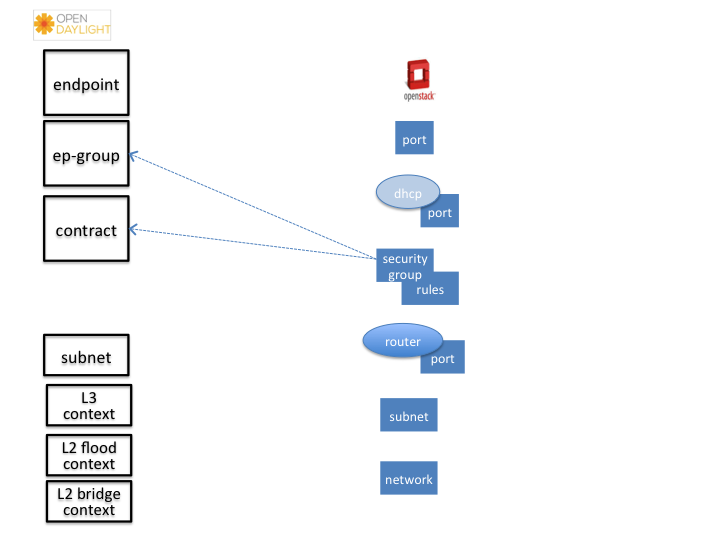 The usage of “port-name” preceded by “ofoverlay”. In OpenDaylight, base datastore objects can be augmented. In GBP, the base endpoint model has no renderer specifics, hence can be leveraged across multiple renderers. The IO Visor renderer feature enables container endpoints (e.g. 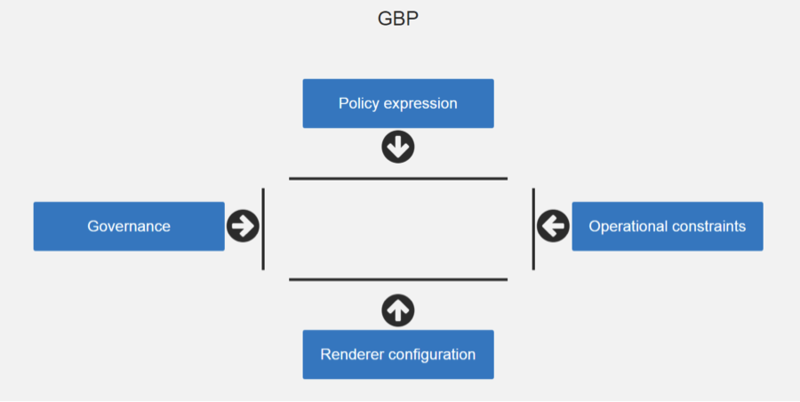 Docker, LXC) to leverage GBP policies. The renderer interacts with a IO Visor module from the Linux Foundation IO Visor project. 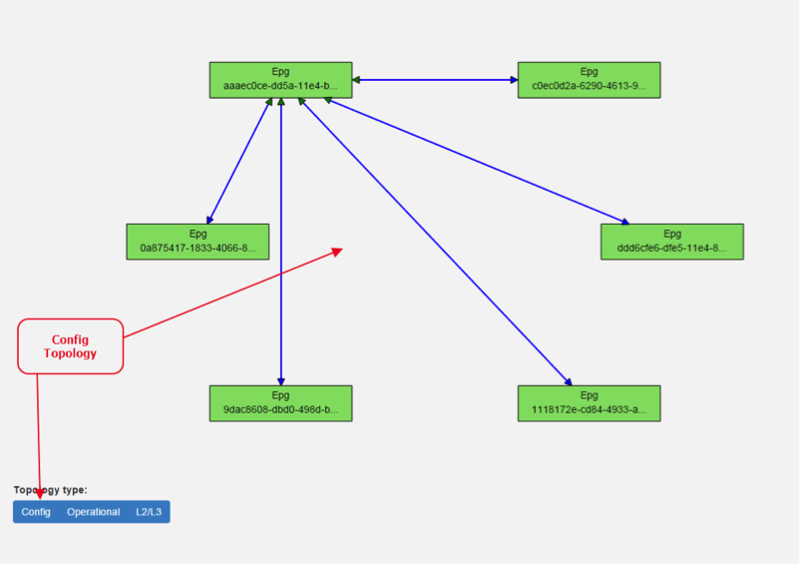 The FaaS renderer feature enables leveraging the FaaS project as a GBP renderer. Please refer to the Service Function Chaining project for specifics on SFC provisioning and theory. GBP allows for the use of a chain, by name, in policy. This takes the form of an action in GBP. If asymmetric chaining was desired, the return path could be direct, or an entirely different chain. All these scenarios are supported by the integration. Then the action instances to associate to traffic that matches classifiers are defined. Note the SFC chain name must exist in SFC, and is validated against the datastore once the tenant configuration is entered, before entering a valid tenant configuration into the operational datastore (which triggers policy resolution). When HTTP is matched, in to the provider of the contract with a TCP destination port of 80 (HTTP) or the HTTP request. The chain action is triggered, and similarly out from the provider for traffic with TCP source port of 80 (HTTP), or the HTTP response. The GBP project for this release has two demo/development environments.